Mayor Rahm Emanuel with some Englewood aldermen, announcing construction of a new Whole Foods Market. ‘We need jobs’ has been the call for decades. Impoverished communities, neighborhood organizations, nonprofits and even local government have long argued for the importance of employment opportunities in battling poverty, combating violence, and have fought for economic stimulus of all kinds in the face of prison expansion, legal reforms and more police on the streets. The ability for oppressed people to participate in traditional economies has been seen as a lofty goal for many of our communities and their advocates, and a core value of movements confronting the state. Yet as new struggles emerge around a living wage and the right to organize, that basic tenet may be coming undone in some important ways. 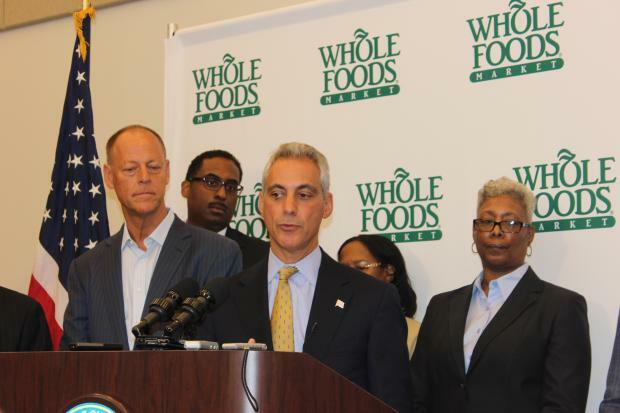 This Wednesday it was announced that, with the support of the mayor, a new Whole Foods Market is scheduled to be built in Englewood by 2016. One of the most impoverished neighborhoods in Chicago, and with one of the highest rates of unemployment, the opening is proposed as part of the food desert initiative–publicly spearheaded by Michelle Obama–to address the shortages of fresh produce and nutritious groceries available in low-income communities. (Walmart and Whole Foods franchises have both begun massive national expansion under this initiative.) The construction and subsequent staffing of the market has some optimistic about the jobs being provided for a neighborhood that is so rarely sought out by new business ventures. Others question the choice of location, asking how a largely poor, predominately Black community will receive the sudden appearance of an expensive food store, whose products have never before targeted them as consumers. The question is, why now? Why, when so much attention and advocacy has been focused on bringing business to the South Side, is Whole Foods just now, and suddenly, announcing its expansion there? The answer is new responses to worker struggle. In 2012, as Walmart employees across the Midwest walked out and protested for the right to unionize, the Chicago government made adjustments to its redistricting laws to open three new branches within city limits, two of them within two of its poorest neighborhoods. In fact, it has only been within the past decade that Walmart has been allowed to build within the city, due in large part to concerns about the minimum wage requirements of the state. Now, as workers in the fast food and other low-paying industries strike around the nation, Whole Foods workers in Chicago have joined in with them, fighting for the same $15 an hour pay and the right to unionize. Should it be surprising that as Whole Foods employees in more affluent parts of the city have brought attention to mismanagement, working violations and poor benefits, the corporation in conjunction with the mayor’s office should seek to open new branches in areas with mass unemployment? There are many questions to be asked; How tied is the Democratic Party to the interests of Walmart, Whole Foods, and the larger vision of disempowered workers? If corporations have the power to control the prices of the products they sell, why aren’t they working in general to make necessities more affordable, to pay their workers and the makers of their products well? Is a Whole Foods on the South Side about accessibility, or a new wave of gentrification, the pushing out of the Black community, and the growing tourism to a “New Chicago” the mayor keeps touting? When we dream of autonomy and self-determination for our communities, are low-paying, de-unionized jobs provided by the racist state or an aloof private sector the primary thing we need to get there? All these questions we should be vigilantly asking as the weeks come, but there is one I am even more interested in: Will their plan work? Will the clear agenda to expand low-paying, de-unionized jobs into the communities most in need of employment serve the goal of quelling protest, or will it expand the struggle? Will it disperse the movement, or push it on into the spaces–Black, Brown, poor and immigrant communities–where struggles are already happening, and have been happening for decades? Can a move like this one unite workers on a larger scale, and build momentum in the fight for real job justice?